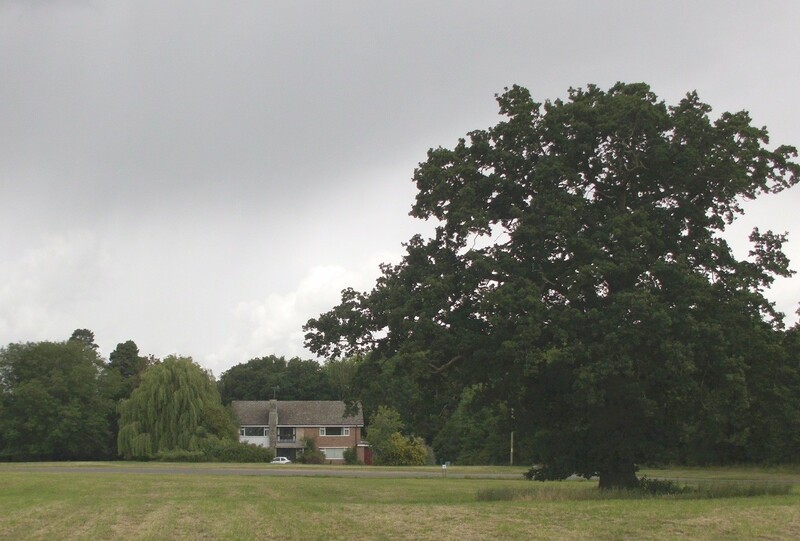 The Wokingham District Veteran Tree Association (WDVTA) has recently recorded all trees qualifying as 'Veteran' in the grounds of the former Arborfield Hall, apart from a few where crops are still growing. 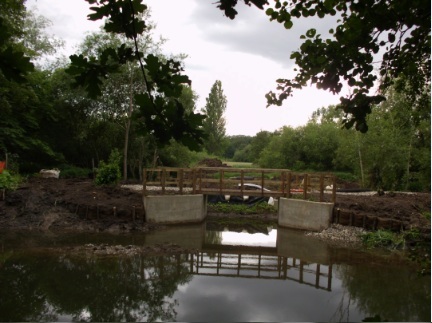 While on-site, the opportunity was taken to record the landscape of the parkland and riverside which are normally closed to the public, and to compare it to earlier photographs of the Hall and its grounds. Click on the photographs to see enlarged views or further information. Several photographs were shown in the Hall Auction Sale catalogue of 1919, and then in 1924 and also in 1926, when the Hall was finally sold. 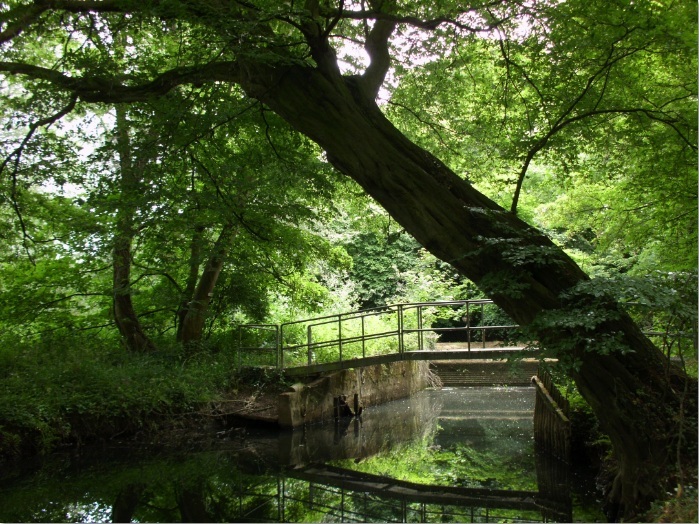 One photograph, here on the right, showed the Drive alongside the River Loddon. Note that the drive was bounded with pines on the left, on a 12-foot slope down to the river's edge, and lime trees on the right. Most of the limes were already quite old, as can be seen by the trunks. However, a couple of lime trees closer to the photographer appear to have been much younger. At this time, it was possible to drive a carriage along the gravel track. In the distance on the right can just be seen Arborfield Hall itself, as built by Sir John Conroy in the mid-19th Century. 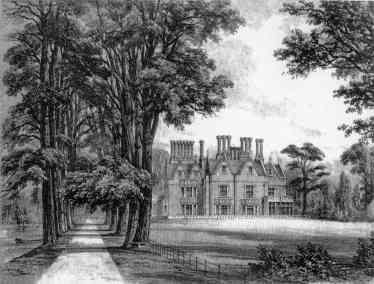 When he sold Arborfield Hall to John Hargreaves in 1855, the Sale document had a picture of the drive and the Hall, as shown below. 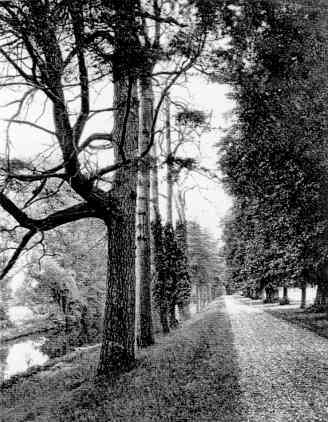 For some reason, the drive was only ever tree-lined from half-way between the Reading Road and the Hall, perhaps to afford an initial view of the river on one side and the parkland on the other. By the early 20th Century, the main roadway swung away to the right, roughly at about the vantage point taken by the painter. This can clearly be seen in the Hall Sale map of 1926, and also from the view of the Hall from the main roadway shown below, taken from the 1919 Sale document. Probably the trees had encroached on the original drive from both sides and made it impassable by wheeled vehicles. It certainly is now. By the 1940s, the main drive had been concreted to handle military traffic, as the aerial photo below shows. The RAF aerial view shown below is part of a of Lower Arborfield and Shinfield photo, dated 10th March 1946. It shows the original drive and the outline of the Hall, plus the roadway and the parking area in front of the Hall. Note the tall tree and its shadow, located between the original drive (just visible, in white) and the curved concrete roadway. 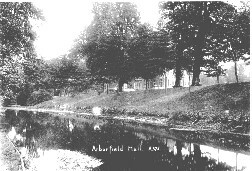 (After Reading University took over Arborfield Hall Farm, the roadway has been re-shaped to accommodate articulated milk lorries.) The water-mill is visible at the top centre right; it had a turbine producing electricity. 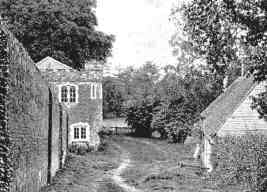 A walled garden can also be seen, to the right of the mill-stream. 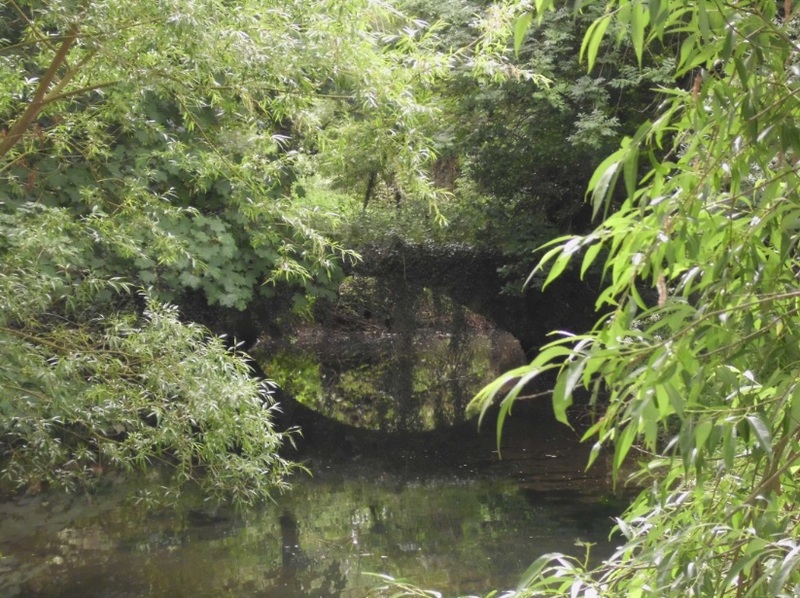 The river itself is towards the top of the photo, much more meandering than the gently-curving mill stream. 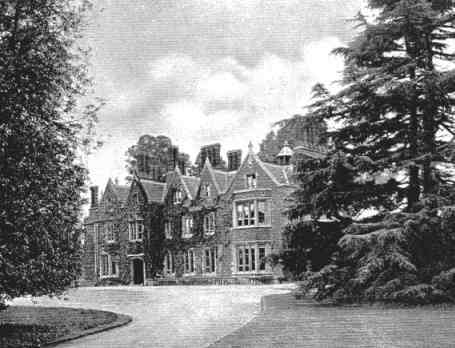 Arborfield Hall was demolished in 1955 by Reading University, and was later replaced by a large detached house called 'Aberleigh', so-named because that was how Mary Mitford always described it in 'Our Village'. 'Aberleigh' is seen in the next photo in June 2011, in the distance behind a veteran Oak tree. 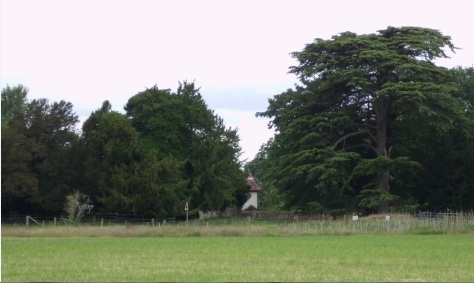 This photo was taken from the field behind East Lodge (the cottage visible behind the old churchyard). 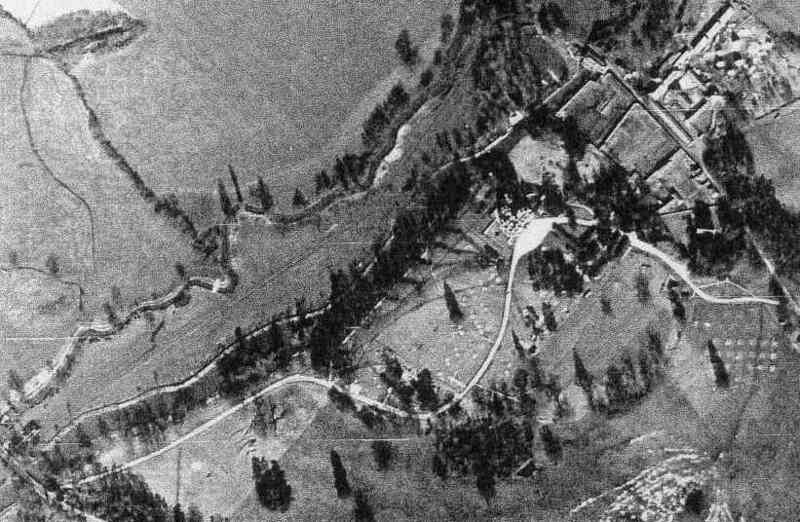 On the aerial photo above can be seen two Oak trees, which were without leaves so early in Spring 1946; this is the smaller one, on the left in the aerial photo. 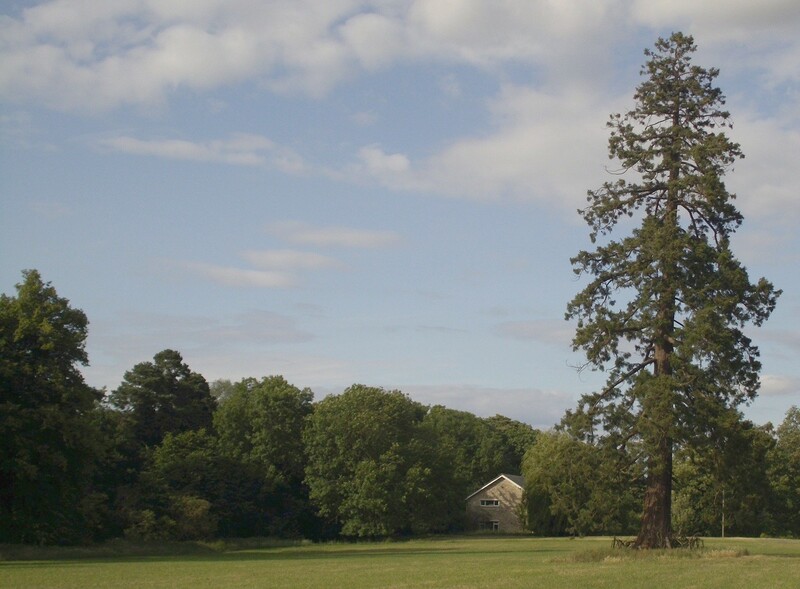 The next view of 'Aberleigh' is from the south of the veteran Sequoia which dwarfs it. 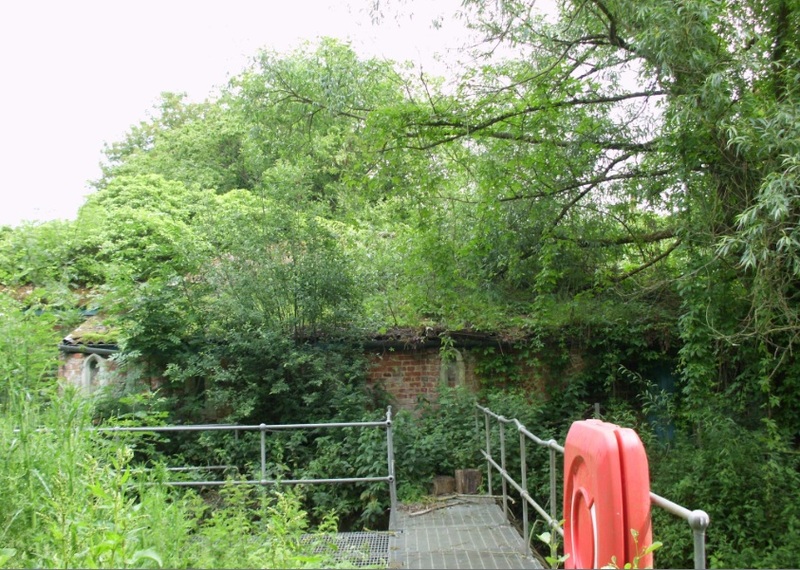 To the left of the house is the original tree-lined drive; however, it is now so overgrown that it is impossible to make out the line of the path between the trees. The trees closer to the camera are Limes, while those behind are Pines. However, in the intervening 60 years, many other trees have grown up. The Sequoia trees are all planted singly. Each is ringed by an iron parkland fence, now rusty and deformed as the base of each tree has expanded. 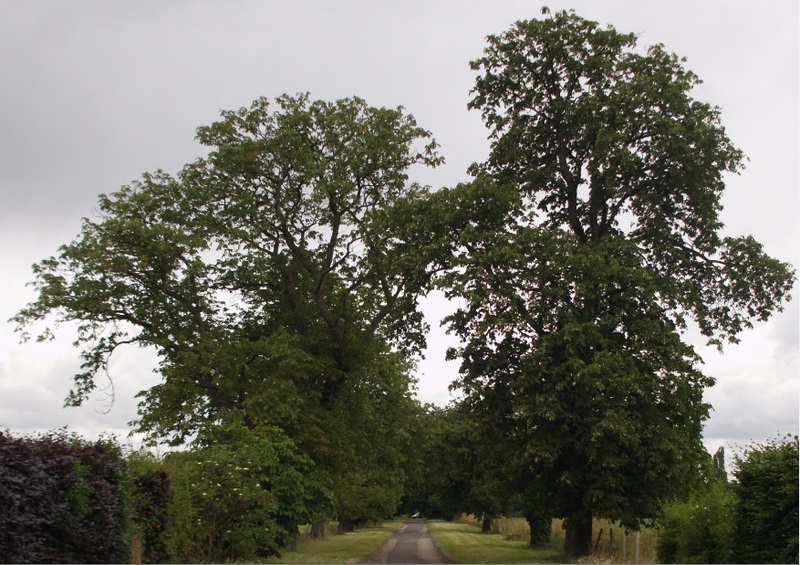 The Lime tree seen on the right may have suffered either a lightning strike or wind damage at some time in the past. 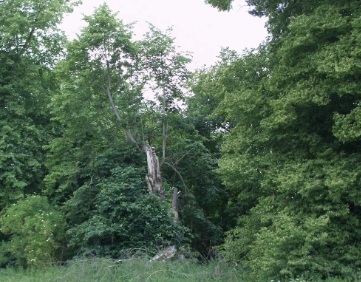 However, it continued growing quite vigorously from its intact branch, as seen in the photo on the right. Underneath one of the adjacent Lime trees was the skeleton of what appeared to be the rib-cage of a deer. The mill stream behind is quite wide and of reasonable depth, as can be seen below, looking upstream towards Arborfield Bridge. 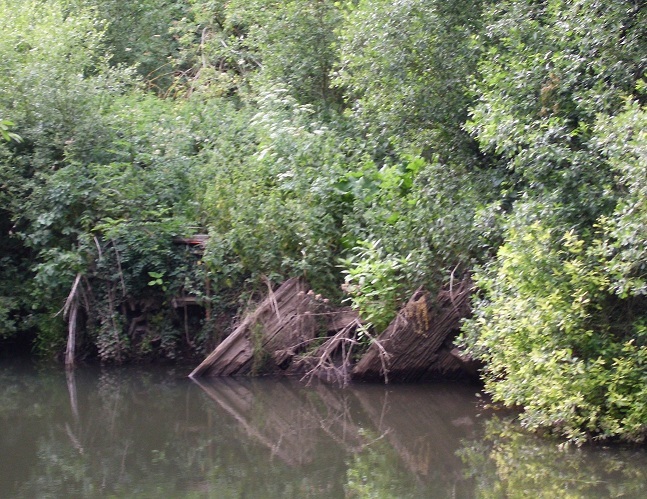 Just in the right-hand corner of the photo can be seen the remains of a wooden structure, on the island between the mill channel and the river itself. The wooden structure can be seen more clearly in the close-up photo below. 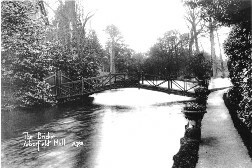 This appears to be the remains of an old footbridge as seen on old postcards such as the Collier postcard below, entitled 'The Bridge, Arborfield Hall' (A788). Downstream of here is a new footbridge on the opposite bank, and behind it the new fish 'Bypass', being constructed to make it easier for fish and wildlife to travel upstream. This is roughly at the point where an old Collier postcard 'A375' (see below) was taken. Further on towards 'Aberleigh' is the main weir, after which the mill stream continues more or less straight until it meets the mill building. 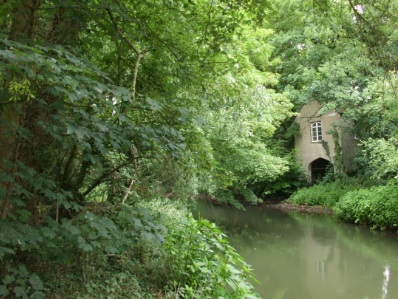 To the right of the mill stream is the boat-house for Arborfield Hall, immediately behind 'Aberleigh'. 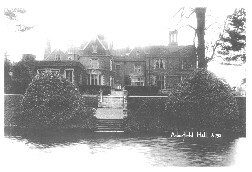 It is now surrounded by trees, though old postcards such as this one from Collier ('A792', above) show that the space between the Hall and the river was much more open. 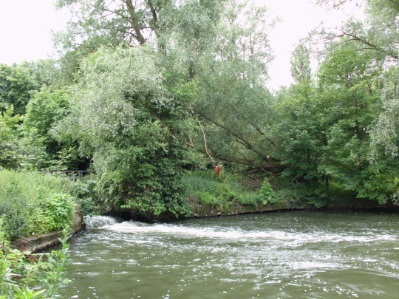 Slightly further downstream is what appears to have been the Lock Pool. 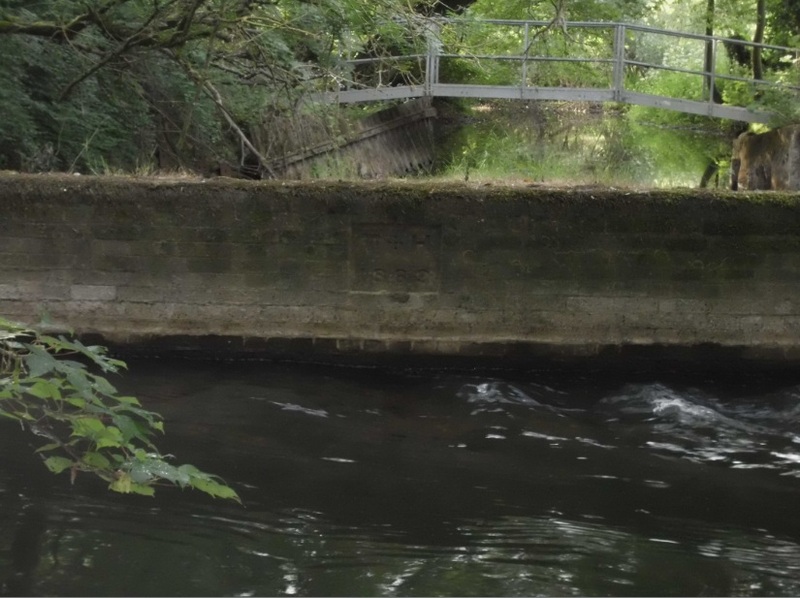 The walls in the background of the photo on the right have been built of bricks and stone to withstand heavy flows of water. 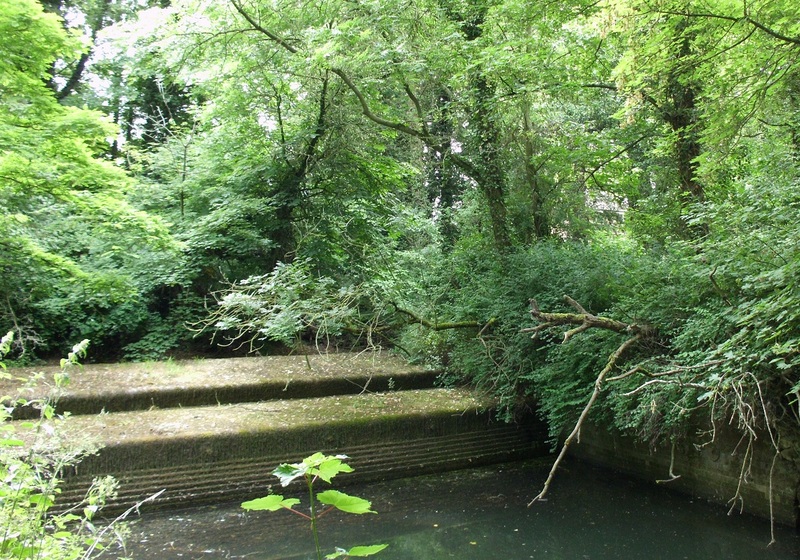 However, when the Hargreaves family took over Arborfield Hall, they carried out some drastic works to remove the link to this pool. In this photo, taken from the Boathouse side of the mill channel, there is a massive wall in the foreground. This wall is designed to act as an embankment. 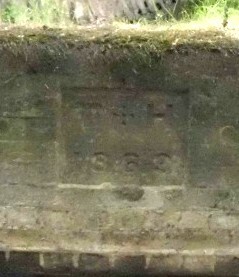 The letters 'T H 1863' in the next photo show that the work was carried out under instructions from Thomas Hargreaves. As seen from the lock pool where the water level is lower, the embankment is massive, being several feet across to hold back the large body of water. 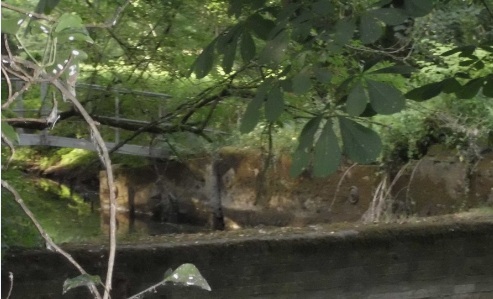 The sheer bulk of the retaining wall can be seen in the photo on the left. The water-mill now looks nothing like the elegant building it used to be. 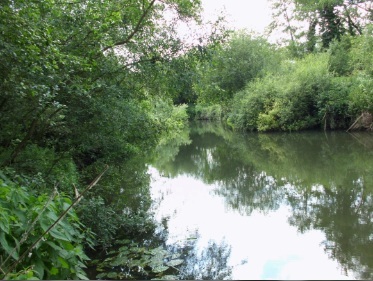 This view is from the mill channel towards the mill. Note the windows. 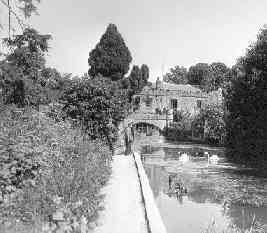 In the 1950s the Mill was much grander, as seen in the black and white photo below. The channel appeared to be wider, too. There is a small weir just before the mill-race, taking the river water north-westwards to rejoin the main river. Alongside it is a veteran Willow tree that fell long ago, but continues to grow. The two-storey building is now only a single storey and much diminished in width. There is a modern cottage alongside it. The track continues down to the river bridge where the various channels join together. This carries the public footpath that started in Church Lane and continues towards Shinfield. After the bridge, another footpath branches off to the left, running close to the main channel of the River Loddon for a few hundred yards before heading in a diagonal line across the often-waterlogged fields towards the 'Magpie and Parrot' public house in Shinfield. Hidden from sight on the left of the footpath are the remains of a brick bridge connecting the islands between the main channel and mill-stream, as seen in the photo on the right. 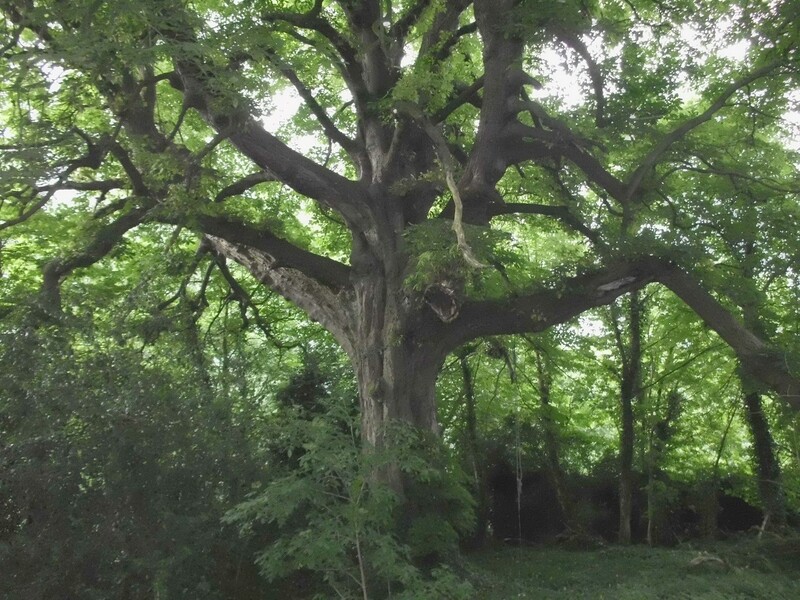 Hidden still further from sight, between the garden of 'Aberleigh' and the Mill, is an enormous horse-chestnut tree measuring almost 6½ metres around its girth. The horse-chestnut trees that line the extension of Church Lane towards the Old Churchyard pale into insignificance by comparison. However, they do provide a fine avenue and a pleasant country walk, as seen below. Until the Foot and Mouth outbreak in 2001, there used to be vehicular access from Church Lane onto Hall Farm, across a cattle grid. The access was barred to prevent infection, and remains barred. Nature has rapidly taken over, and the tarmac drive now dwindles to a narrow footpath on either side of the cattle grid. Vehicles must now access the site from Reading Road via a security gate. Although pedestrian access is mainly limited to a couple of main tracks across Hall Farm, walkers can see many of the trees that qualify as 'veterans' in the fields either side, and in the distance. To see the rest, they must content themselves with photographs of the trees located on the WDVTA parish map. 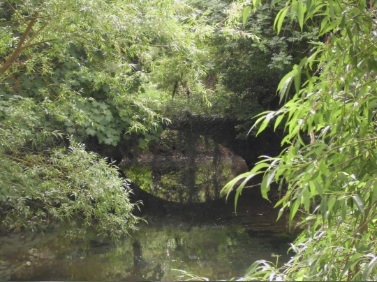 - just choose 'Arborfield and Newland' parish and click on 'Show Parish Trees'. Trees in the Old Churchyard are of course visible - but not from this viewpoint, which is in the field adjoining Church Lane. There are now regular working parties in the Old Churchyard - if you want to join them, please click on the link.